When it was time to leave and we started the farewell, I surprised myself giving kisses, hugs and speaking words of affection to the people with whom, for the whole week, I had exchanged (maybe) a fleeting glance or a nod of the head. I found them in front of me, these people, and I felt them damn family, even though I barely knew their nationality. I felt that between them and me there was now a bond, a true bond, the one that born when you share a decisive experience with someone; a sort of spiritual camaraderie, an elective assonance that goes beyond conventions and requires nothing but itself, to subsist. 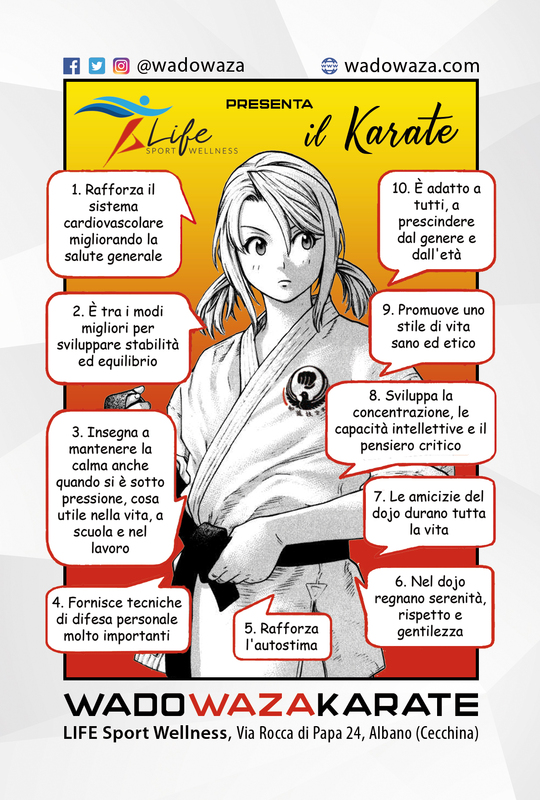 So I understood another aspect of the power of this wonderful experience that is the Swiss Wadokai Summer Camp held by Roberto Danubio sensei (that I have already mentioned here and here). There are things you can grab on the fly, some others on which you have to return several times, to really understand them. I do not think it depends on things in themselves. It depends on us. Every object we encounter, we know it through the filter of our experience, and since our experience is gradually expanding and changing, the same object, known in two different moments of life, appears different and differently able to be known. It took three editions to me to understand that this annual event, which is always held in the second week of July in Filzbach, in the Swiss mountains, is building a new sense of community among the Wado-ryu practitioners from all over Europe – and that I am part of it. According to the Budo Charter, a good martial artist is the one who keeps an open mind and an international perspective. The open mind is needed to profit from the comparison with others, the international perspective is necessary to ensure that this comparison is as broad as possible. The Wadokai Summer Camp held by Roberto Danubio is permeated by these two qualities. This year, for example, there were wadokas from Switzerland, Italy, Finland, Sweden, Hungary, United States of America, Greece, Germany, England, Ireland and Belgium and, regarding the JKF certified international instructors – as well as Roberto Danubio (which, let’s remember it, is one of the very few non-Japanese masters to have achieved the 7th dan in the Japan Karatedo Federation Wadokai), Alessandro Danubio (6th dan JKF Wadokai) and Eveline Danubio (5th dan JKF Wadokai) – there were also Tracy Bob Foster (6th dan JKF Wadokai), Marc Rolli (5th dan JKF Wadokai), Giuseppe Carloni (5th dan JKF Wadokai), Benito Benitez (5th dan JKF Wadokai), Rolf Wirth (5th dan JKF Wadokai) and Daniela Eckerle (4th dan JKF Wadokai). In such a context, it is practically impossible not to make any progress each time. But some improvements need time, to reveal themself. As we said before, they need us to accumulate and modify our experience. In each of the previous editions in which I participated, I realized that I had some small, sudden enlightenment regarding this or that principle already known to me, which, up to that moment, I had understood only on a theoretical level. (Martial arts have this characteristic: to really understand a principle, it is not enough to understand it theoretically, with mind and thought, as if it were a philosophical or mathematical concept. The body must also understand it, and you can say it has understood only when it intentionally succeeds in applying it). But the enlightenment that I had this year is particularly precious to me, because it is the result of the accumulation of years of frustration, misunderstandings and failures. I’m going to tell you what it is, but I want to warn you: you will be disappointed. You will think: everything here? Yes, that’s all. What this year I understood with my body, although I had understood it many years ago with my mind, is about the Power of Wado. Or, to say it better, about the fact that in Wado-ryu you must never use the brute force, because the less muscle-strenght you use, the more power you can generate. This is something that has been repeated to me for almost forty years, and that in my turn I repeated incessantly to my students. Something that I had also experimented and applied in the execution of the karate techniques and that, therefore, I thought I had already understood. But I was wrong. It happened just the last day, in the last hour of training. We were performing a kata. My legs and arms were exhausted and painful, the soles of the feet burned and consumed by a week of intense training, every morning and afternoon, with no possibility of recovery if not in the (few) hours of sleep. I felt all the heaviness of a body that would have exchanged ten years of life for a sofa and it seemed to me, suddenly, that I could not move anymore. Then, a part of me, gave in. As if it had sent me to hell. As if it had sent everything and everyone to hell. And my body began, suddenly, to fly. It flowed light, not effort anymore, quick and crystalline, letting my dogi to snap as he had not yet succeeded in the previous six days. It was as if my body had stopped trying to apply the principles of the Wado (mudana dosa, fluidity, relaxation) and had become those principles itself. A minute of pure happiness. I don’t know if this enlightenment will be permanent. Probably not. I feel that the road is still long. But that’s not what matters. What matters is that every time I come back from the Roberto Danubio’s Wadokai Summer Camp, I find myself enriched, inspired and I always have a good reason to come back there in Switzerland the next year. To continue to cultivate that feeling of community – and family – that is becoming so dear to me. And to understand, each time, a new aspect of the Power of Wado. PS: Don’t miss the Instructors Seminar held by Roberto Danubio in Rome. Register!